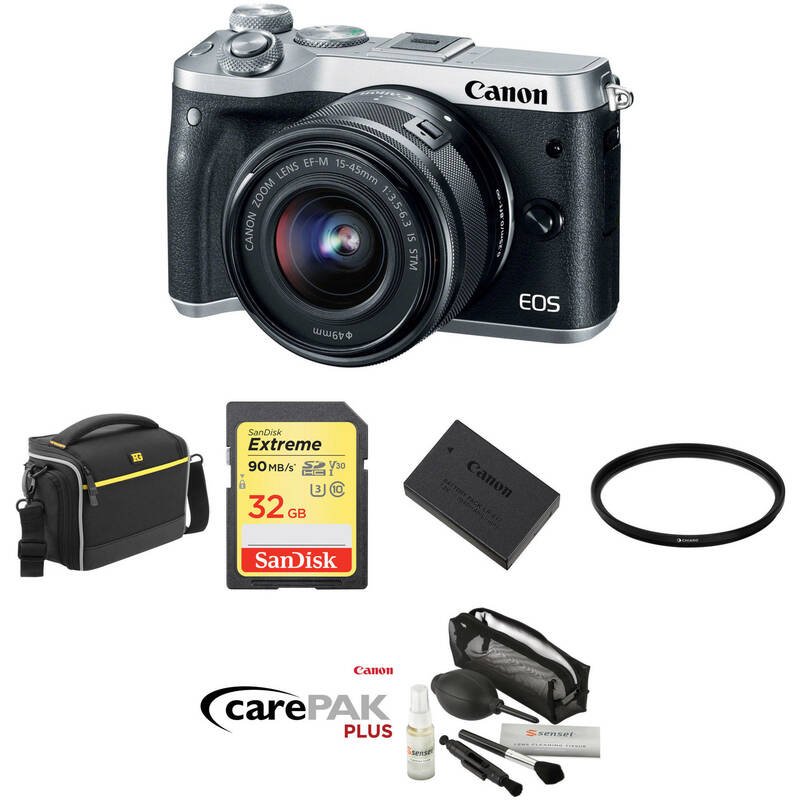 Comprising everything needed to begin shooting, the silver Canon EOS M6 Mirrorless Digital Camera with 15-45mm Lens Deluxe Kit from B&H bundles the sleek mirrorless body and standard zoom with a shoulder bag, a memory card, a microfiber cloth, a spare rechargeable lithium-ion battery, and a 49mm UV filter. Additionally, a 2-year Canon CarePAK PLUS accidental damage plan is also included for further protection to your equipment. A well-rounded mirrorless camera for both stills and video use, the silver EOS M6 from Canon offers apt imaging qualities with a refined, functional physical design. Making use of a 24.2MP APS-C CMOS sensor, both high-resolution stills and Full HD 1080p/60 video can be recorded, while the DIGIC 7 image processor affords a wide expanded sensitivity range from ISO 100-25600, along with quick continuous shooting up to 9 fps. The sensor's design also facilitates Dual Pixel CMOS AF, which uses phase-detection autofocus for quick, accurate, and smooth performance to suit both stills and video use. Additionally, Combination IS 5-axis image stabilization also helps to realize steady, shake-free recording by minimizing the appearance of camera shake. This Spudz Microfiber Cleaning Cloth has an integrated storage pouch with the B&H Photo logo, and hook for keeping the cloth close at hand. This cloth is useful for photographers, videographers, birders, and anyone who needs to clean their optics in the field. The 49mm 95-UVAT UV Filter is one of Chiaro’s highly-rated protective UV filters with 95% light transmission. It’s useful for photographers of all levels who demand high-quality glass and other essential features for great image fidelity and construction. Box Dimensions (LxWxH) 2.5 x 2.3 x 1.2"
EOS M6 Mirrorless Digital Camera with 15-45mm Lens Deluxe Kit (Silver) is rated 5.0 out of 5 by 1. Rated 5 out of 5 by Christina L from Good Quality Images & Compact to go anywhere Good Quality Images & Compact to go anywhere! We are custom home builders and this is perfect for shooting houses using tripod and flash. A lot of times I do not need the additional flash. Also great for family on the go picture needs. Highly recommend.